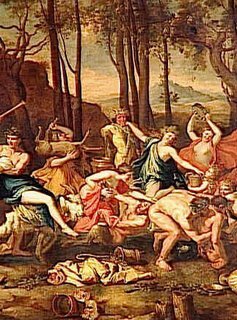 This is the first day of the Saturnalia. The Saturnalia honors Saturn (Cronus) and is one of the most festive and uninhibited that the ancient Romans celebrated. It went on for seven days and encompassed the Winter Solstice, a time of religious observance for cultures the world over. Feasts were provided by the temples and were open to the public, the poor and the homeless. Servants and masters were met on equal terms. Unable to prevent the people's natural festive inclinations at this time of year, early Christian leaders, clever Greeks that they were, moved Christmas to December and claimed the celebration for their own. This week-long party, culminating in the Sun's entry into Capricorn and continuing until Dec. 25, is very old, from the time when Saturn was not yet ruler of Capricorn, and the bringer of limitation, old age, illness and death, but was actually god of the evergreens, an ancient Italian version of the ever-present Green Man. The Saturnalia is the year's great festival of thanksgiving, beginning with the giving of gifts and the forgiveness of debts, and leading a week later to the year's wildest revel when all classes mingle, servants get to make fun of their masters, donkeys and other beasts of burden are honored in mock processions, fool kings are crowned, and people of all orders throw the last grand blowout of the year, just before the onset of winter and the Rebirth of the Light. A Lord of Misrule was often elected to mock the role of authority and direct his followers in ribald and humorous activities. Some folklorists (Frazer and Graves) believe he was a stand-in for the King, who and was sacrificed at the end of the time period in the King's place but during his brief reign of thirty days, he assumed the king's perogatives, dressing in royal robes, doing anything he wanted and commanding obedience. The Greek God equivalent to Saturn, is Cronus. Saturn carries a sickle, like the Grim Reaper. Cronos, who ate his own children rather than let them surpass him, gives his name to terms like chronological. Both are Time-Gods, who bring death and limitation and may fight to preserve their reign, even though they know it is time for them to be replaced with new life, just as the old year must die to give way to the new, a struggle depicted in many winter solstice customs. This and the following days were also known as the Angeronalia, from Angerona, to whom a sacrifice was made in the Acculeian Curia and of whom this day was a state festival. This is the Santerian festival of Babaluaiye, honoring Babalu who punishes people with smallpox, leprosy and other viral afflictions. Babaluaiye means "father of the world." Babalu represents the results or diseases of overindulgence and excesses, demanding moderation and humility in all things. Babalu is the wrath of the earth and will punish those that disrespect it. He is associated with both with inoculation and immunization, providing the means to cure disease or cause it. His color is royal purple, and he is identified with people who have broken or missing limbs, derelicts, beggars, and with those who have been abandoned and forgotten by society. In Orkney, a sow was killed on this day. The pig has long been a significant animal at this time of year, a symbol of abundance, especially in the north.